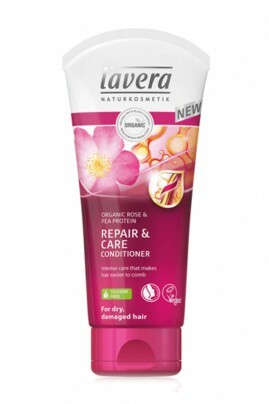 Lavera Repair & Care Conditioner strengthens the structure of your hair and leaves it feeling smooth and supple. Its innovative formulation with organic rose blossom water and pea protein provides your hair with important nutrients in a natural way, while targeting and repairing damage. Lavera intense care that makes your hair easier to comb ! After applying Lavera Vegan Shampoo Dry & Damaged Hair, massage a walnut-sized of Lavera Hair Conditioner amount into freshly washed hair using your fingertips, leave for 2 to 3 minutes then rinse thoroughly. Strengthens naturally your hair structure !